- Getting photo postcards to see what things are like there. -And of course, the fun of getting mail! Little Passports provides all those things, without the chore of having to write back to an actual pen pal. Little Passports is an educational program where about every 3 weeks your child receives a package in the mail from "pen pals" Sam and Sofia. The story goes that these two kids found a magical scooter that can take them anywhere in the world, and they want to write to a pen pal to tell what they find and share their adventures and souvenirs. 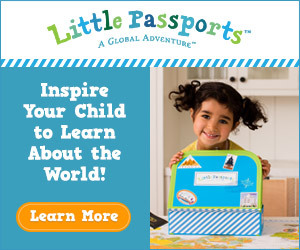 We got one month of Little Passports free for the purpose of this review. We received the World edition, which is aimed at children 5-10 years of age. (There is also a USA version that is for the 7-12 age group.) The first month you get everything you need to get started - a suitcase to keep your treasures in, a letter from Sam to your child, a wall map of the world, a travel passport to keep track of adventures, stickers, a postcard, an activity sheet, and access to online games. Future packages will be themed around a specific country and include stickers to put on your suitcase, photos, letters, fun souvenirs, and more. We opened the suitcase together and I read her the intro letter and she was totally into it. We put a photo in the passport book and wrote her name inside it (and I explained what a passport was). The wall map is a nice, large one and I took the opportunity to show her where we live, where her pen pal lives, and where the Olympics are being held. She also loved the postcard, a picture of Sam and Sofia on their magic scooter, so she "knows what they look like," she said. Her pretend play since this came in the mail for her has been her and Sam traveling on the magic scooter to different places, with Kay taking out the map and unfolding it to see where they'll go next. The idea of doing this as pretend pen pals adds an extra element of fun. Sending interesting and age-appropriate activities about different countries would be nice on its own, but adding the personal touch of being from Sam and Sofia, children just like your own who just happen to be able to travel wherever they wish, makes for a more individualized feel. Another thing I like about Little Passports is you get to choose how long your subscription lasts and how often you pay. You can choose 6- or 12-month plans, or go with the month-by-month option. This would make a great gift! That looks like a fun thing to get every month. That looks like something fun to do with the kids! Looks so fun for little ones! Will definitely have to check it out! Looks like so much fun! I have to look into this one! I have always thought these looked so fun. I can't wait till my son is old enough to enjoy it! He is only 2 now. This is lovely for my little one. She is not interested with places. 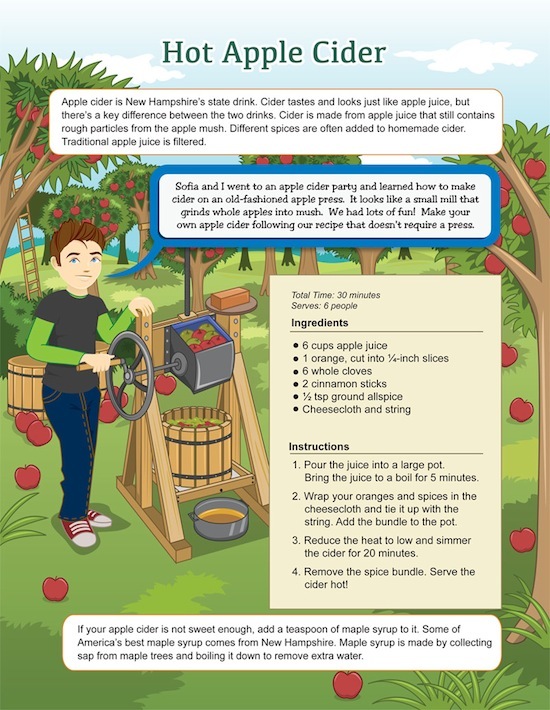 What a nice educational subscription for kids :) I want to check out this site too. Thanks for sharing this! My 6 years old will surely enjoy. This confirmed to me that travel and learning about others is fun at any age. The program sounds great.